Cipete Utara Urban Village, Kebayoran Baru, South Jakarta launches Warung Daur Ulang (recycle shop) at Citra Antasari Waste Bank.
" We already have this idea since 2012"
Cipete Utara Urban Village Head, Mohammad Yohan said, Warung Daur Ulang is an innovation that can encourage residents to care about their environment. It also can increase total waste which is submitted by residents. 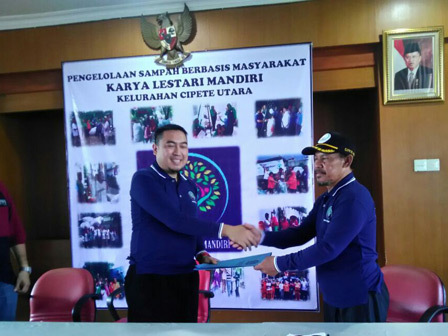 "We already have this idea since 2012 and finally we can realize it now by launching Warung Daur Ulang in Cipete Utara Urban Village," he stated, Saturday (5/19). He conveyed that actually Warung Daur Ulang has the same basis with waste bank. "Residents can exchange their collected waste to Warung Daur Ulang to get staple commodities such as sugar, cooking oil and others which price is equivalent with general price of waste," he explained. According to him, Cipete Utara Urban Village currently has 30 waste banks. In the future, his side will continue to develop waste bank thus many people will be encouraged to take a part in this movement. "It needs more innovations to develop waste bank as the alternative of waste management," he said.